This will be an good news for the people who are willing to experience the 3G internet. As every company in India has launched 3G there is a huge competition on between Airtel, Idea, Vodafone, Tata Docomo, Aircel etc. Every company is launching there new offers and trying to attract customers. As Mobile Number Portability started this became a huge problem for the network providers as they need to satisfy the customer needs. This is just because the customers have the right to change there network by a simple process. Along with this problem, all the network service providers have invested a lot of amount over changing the equipment such that it is compatible to the 3G. But the main problem is that the data charges for 3G are very high when compared to 2G plans. So, people are not so interested towards these 3G plans which are not so affordable. As this became a big headache to all the companies, Aircel came out with a beautiful offer which attracts everyone without any doubt. This plan is just to make the people experience the 3G speed and get addicted to that. As we know, Aircel brought a big revolution in data plans which are the offers of 2G internet is Pocket internet pack and Pocket Internet Smart (3G) . Now it gonna do same as before which introduced a new plan called 3G Mornings . In this plan you can use free 3G internet from morning 6 am to 9 am. In these timings you can browse unlimited internet. Once you activated this it will be valid for 30 days without any charges. 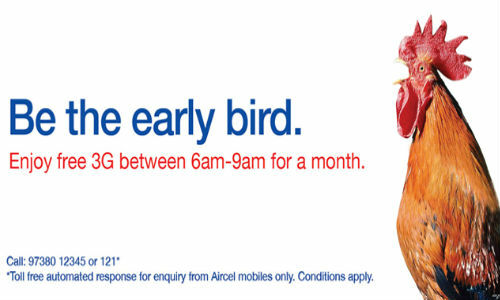 This helps the people to go towards 3G handsets and also to get the experience of 3G on Aircel. The Aircel launched this plan not only to show the difference between 2G and 3G internet speed but also to give them a experience on Aircel. This is so simple to activate. Before activating this plan first check whether your Aircel sim is 3G compatible if not just send an sms " Start 3G " without quotation marks to 121. Once your sim is 3G compatible, Now just dial *122*456# just wait for few seconds. Once the Activation is completed you will be receiving a conformation message for Aircel. As you get that conformation message you can use free 3G data for 30 days in mentioned timings.